“Dream Catcher” Phil Woodgate is the new NZWPW Champion after a shocking turn of events at Road to Rescue this past Saturday. The event, held at El Rancho in Waikanae, was to feature local hero Paul Sayers challenging “Rufguts” Roddy Gunn for the NZWPW Championship in main event of the evening. However, Dream Catcher talked NZWPW CWO Rehua into making the match a triple threat by effectively trading his guaranteed main event at Power Play for a shot at the title then and there. It first appeared Dream Catcher had injected himself into the match so as to see the NZWPW Championship remain around Rufguts’ waist. The Nobodies were set to receive an advantage in the match with JC Star beating Ben Mana earlier in the night – the winner of the match serving as special referee for the main event. Rehua had deemed JC Star unfit to referee after the taxing match though, and allowed Ben Mana to oversee the contest. Dream Catcher spent almost all of the match on the outside of the ring, allowing Rufguts and Sayers to battle just as they would have in the advertised main event. Everything changed when Sayers brought a table into the ring though, and leapt off the top rope with a cross-body press designed to drive Rufguts through the foreign object. 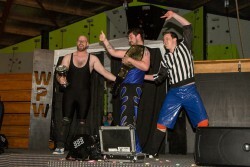 The NZWPW Champion grabbed Ben Mana and dragged him into Sayers’ flightpath to soften the blow, and led to all three men crashing through the table – leaving the match without a referee. JC Star quickly made his way to the ring, wearing a referee shirt, and shockingly blasted Rufguts with a superkick. It quickly became apparent it was Rufguts—rather than Star—who would be leaving The Nobodies following the blow as Dream Catcher dove on top of Rufguts and Star counted a fast three for a title change. Axl—who won the He Toa Cup from Mr Silver earlier on the card—hit the ring for a three-on-two beatdown on Rufguts and Sayers as Road to Rescue came to an end, leaving a new-look Nobodies with the NZWPW Championship.